The recent report published by Cardiff Business Partnership proposing the development of an integrated metro system serving Cardiff and South East Wales. The report made a compelling case for the metro based on business needs and economic development, but contained only limited details of a proposed network. One issue that came across strongly was the need to fully devolve rail transport so to take control of rail investment in Wales, which is currently starved of funds by Westminster. This will also give an opportunity for the Assembly Government to demonstrate what it can do with its new found powers after March. The three systems should operate as a fully integrated and coordinated network with common ticketing which includes local bus services. However, each of the individual Metros should retain a separate unique identity, supported by relevant local authorities. The lines would be funded by a combination of central (WAG) grants, local authority grants, European Objective funding, and by private business. The overall scheme could be developed over a 10 year period at a cost of around £1000 million , but the initial system could be established within 3 years at a cost of only £200 million. These costs do not include electrification of GWML from Bristol to Swansea which has been costed at around £300 million and the redevelopment of Cardiff Central Station which is estimated at another £100 million. These schemes should proceed independently of the metro systems, although they would clearly complement and enhance each other. There would of course need to be some expenditure on schemes in South-West and North Wales so as to avoid accusations of Cardiff-centric spending, but this should be manageable. 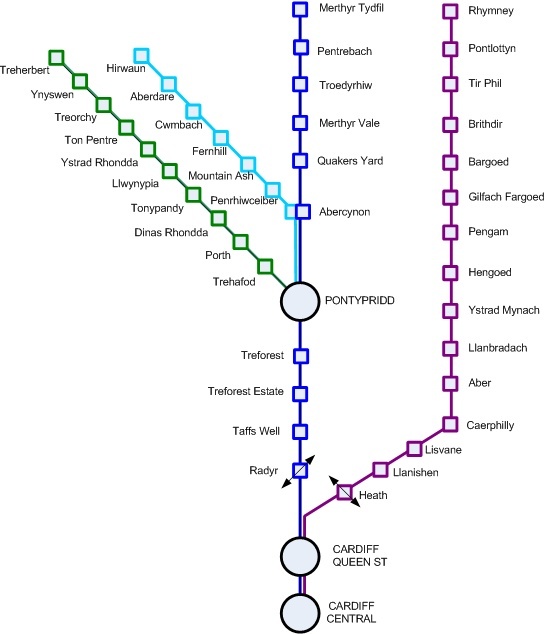 Considering the Cardiff Metro system first, Cardiff already has a fairly extensive rail network but with a little bit of effort (and for relatively minimal cost) it could be turned into a comprehensive metro network. Firstly I would establish a series of stations along the mainline in eastern Cardiff at St Mellons, Rumney, Rover Way, and Splott, then use these to operate through services at a frequency of two trains per hour (2tph) from St Mellons via Cardiff Central to Barry, calling this the South Cardiff Line. In the East, St Mellons would become an interchange station for network rail services (not InterCity) and for connecting with Newport Metro services – trains could also run through to Newport. In the west, Barry would act as an interchange for Vale of Glamorgan services to Bridgend, and which would then make only limited stops into Cardiff. Initially the cost of this line should be relatively small, involving only three new stations at a cost of less than £5 million each. The line shall initially use existing diesel trains, but with the intention to upgrade these later when the GWML is electrified. At this stage the cost of electrifying the Barry branch would be around £30 million, and new trainsets costing around £10 million. The line should also be extended direct to Cardiff Airport and this extension be funded by the airport operators. The second stage of the Cardiff Metro should be to redevelop Cardiff Queen Street Station to allow trains to run directly through from Cardiff Bay to Radyr initially at 2 tph, as the Cardiff Central Line. I would also add new stations at Maindee and Gabalfa, with Radyr becoming an interchange station with Valley line services. The initial cost of this line including redevelopment of Cardiff Queen Street and two new stations could be around £50 million which would improve access to the bay from North Cardiff. This line should be the first to be electrified, which would then continue northwards to Pontypridd and then Merthyr as part of the Valleys line electrification. This would cost around £30 million and with new trainsets costing another £10 million, and which should allow frequencies to be increased to 4tph. 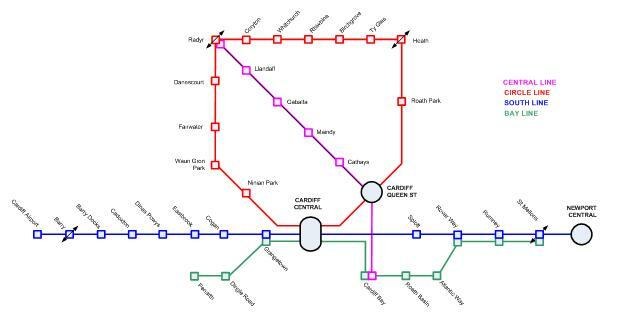 The third stage would be to implement a scheme which has been talked about for a number of years, by building a new section of rail to link the Coryton and City lines into a continuous circular line which I unimaginatively name as the Cardiff Circle Line. This line would cross the existing Valley Line and Central Line around 400m south of the existing Radyr station, so I would propose relocating this station at the same time, which would become a two level station with stairway connection between platforms, and would become a main interchange station. I would also add a new station on this line at Roath Park . The initial cost of this development would be around £50 million (mainly the cost of the new bridge across the Taff) but this line does not need to be a priority for electrification, as it is largely self-contained and does not need a high capacity. At a later stage, following successful development of the South Cardiff Line I would then create a new train-tram line, initially following the South Cardiff line between St Mellons and Rover Way, but then swinging south-west along the existing trackbed to Atlantic Way and onwards to Roath Basin where there would be new station. The tram would then need to thread through to the existing Cardiff Bay station, and then head north, leaving the existing tracks near Callaghan Square and entering Cardiff Central at the existing mail depot. The line would then follow the line of the existing line to Penarth, with services running at 2tph between St Mellons and Penarth. This line would require new trackbed between Rover Way and Cardiff Bay and around Callaghan Square, as well as platform modifications at Cardiff Central. Assuming that this would follow electrification of the South Cardiff line, then the incremental cost of this line would be around £100 million. This would significantly improve access to Cardiff Bay and also enhance the area South of Cardiff Central for further development. This could also be added to later with extensions to Sully and St Fagans in the West and maybe Pentwyn and Cardiff Gate in the East. 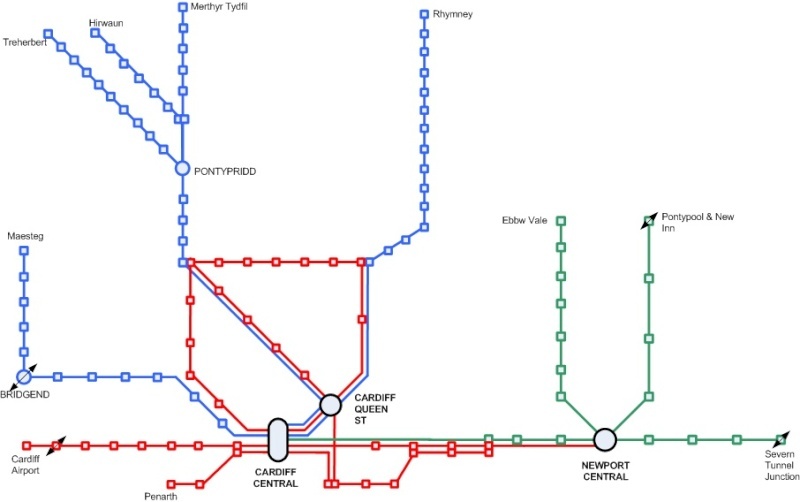 The Gwent Metro could be developed as an ‘X’-shaped network based around Newport (to be renamed Newport Central) using the existing heavy-rail network. For the time being this can be operated using diesel trains, but these lines should be electrified later once the network is established and following GWML electrification. One line should run from Ebbw Vale to Rogerstone then turn east through Newport Central and onwards to Severn Tunnel Junction. New stations should be placed at Magor, Llanwern and Maindee. Severn Tunnel Junction should provide an interchange with Network Rail services, while Llanwern should be developed as a park & ride facility. 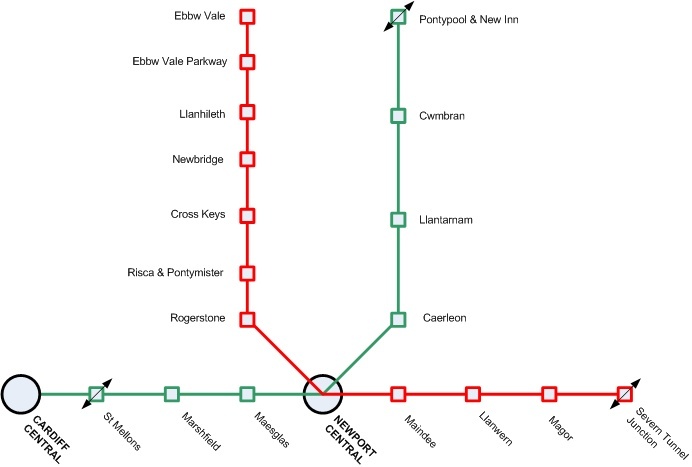 The second line should utilise the existing line from Pontypool to Newport Central with additional stations at Llantarnam and Caerleon. Pontypool would be the interchange station for Network Rail services and a park and ride scheme could be developed at Llantarnam. The line would then continue west to Cardiff Central, with additional stations at Maesglas, Marshfield and St Mellons, which would be the interchange for Cardiff Metro services. The first phase of the Gwent Metro can be introduced relatively quickly with an initial frequency of 2 trains per hour (tph) on each line. This would require only some new stations, and resignalling and I estimate the overall cost of this could be as little as £50 million. Later phases could include an additional branch off the Ebbw Valley line to Abertillery, and a branch from Pontypool to Blaenafon, with frequency of 2 tph on each branch which would increase the frequency to 4tph through the core network. Later electrification and new rolling stock would add a further £150 million to the cost, but this is not necessary to establish the Metro. This already exists in all but name, with the existing Merthyr, Rhondda and Rhymney Valley lines already acting as feeder lines into Cardiff. But to turn these lines into a metro system, the key would be electrification to increase frequencies. To improve journey times, trains would stop at all stations north of Pontypridd, but then continue as express services to Cardiff Queen Street, stopping only at Radyr interchange. A separate stopping service would start at Pontypridd, maybe as an extension of the Cardiff Central line. The Aberdare line would be extended to Hirwaun, but otherwise, this network is already in place, and the first phase of electrification should be from Cardiff to Pontypridd to Merthyr at a cost of around £100 million, with the Rhondda and Hirwaun branches added later for a further £100 million. The Cardiff-Maesteg line could also be added to the metro network following electrification of GWML with additional stations at Miskin and St Fagans for a further r £50 million. Future developments could also include a new line to Beddau, which I have not costed. Finally, the three networks should be fully integrated - not only with each other but with network rail services and local bus services, It should be straightforward to integrate Cardiff Bus and Cardiff Metro, and Gwent Metro with Newport Transport; but it will take a little more effort with the private bus companies in Glamorgan. I have given some thought to naming the network with acronyms - I rejected Cardiff Area Rapid Transport as I didnt want to put this before the horse - and I rejected South East Wales Electrified Rail as this smelled. Very good, we need some cross valley services also, an express bus for the heads of the valleys linking Hirwaun and points west with Ebbw Vale and points east. I would also suggest that within Cardiff we look at a restricted stop express on road service, and that consideration should be given to this being modern trolly bus system (relatively cheep to set up and fast acceleration of electric vehicles are a plus). Why stop at Hirwaun? A little bit of building new track would get the line to Glyn-Neath, and not far after that join the existing freight only line to run trains down past Resolven to Swansea Docks. You could also run trains into Swansea Docks along the frieght-line that serves Onllwyn coal wash, and using the Gwaun-Cae-Gurwen branch you could run trains either to Swansea High Street or Swansea Docks, through a new 'Ammanford Central' station, on existing rails. My maps (see later), also illustrate a longer-term proposal, rebuilding a lost line up from north of Morriston towards Ystradgynlais. Now, getting to Swansea High Street from the docks is potentially awkward, heavy rail would have to terminate at a 'Swansea Docks' station, so maybe it'd be better to run Glyn-Neath/Hirwaun/Onllwyn to Swansea as a tram line, which could reach Swansea High Street station and Quadrant bus station (and later extend that tram line through to Mumbles). Anyway, then your SEWIN would serve most of South-East Wales, right up to the border with South-West Wales (Swansea), and maybe even straying accross that border into Llanelli. One other thing is why does your Vale Of Glamorgan service stop at Cardiff Airport, the service already runs through to Bridgend, why cut it?